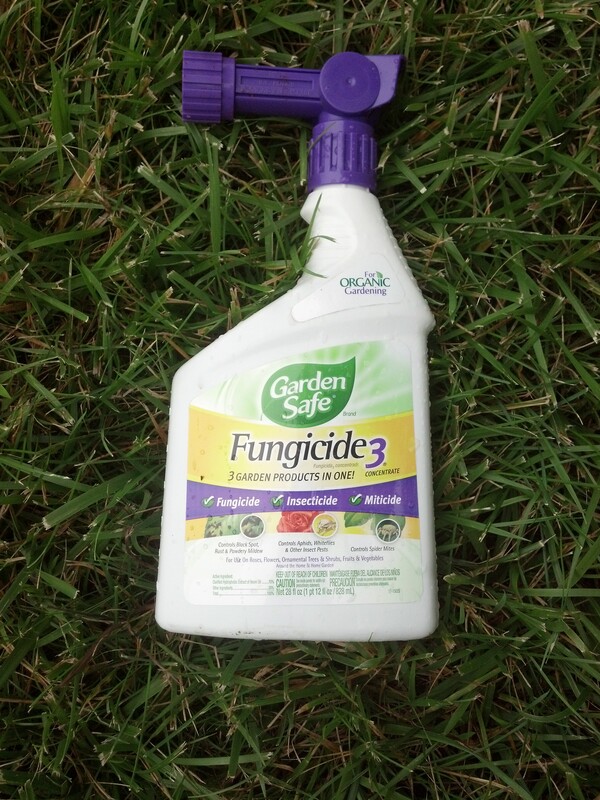 I am going to stop using this class of insecticides on my roses. I value bees more than hate japanese beetles. My bottle of Merit 75 WP will go to the household hazardous waste drop-off. I will use up my stock of All-in-One but only on roses that are not going to bloom, like OGRs that have already bloomed for the season….hmmm… I guess I should research how long the compound stays in the plant. I am not giving up the use completely. Imidacloprid is the active ingredient in Advantage flea treatment. I hate having fleas and I do not see how use on fleas would impact bees. It is based on Neem Oil, which I have tried in the past, with mediocre results…. but it a more organic pesticide solution to both insects and fungus, like the ever present black spot. What particular attacted me was the packaging. It attaches to my hose. Ok, I am getting lazy in my old age. I never seem to get around to going out, mixing up the stuff in the sprayer, spraying the bushes and then cleaning the sprayer. In addition, the hose-attached built in applicator give sufficient pressure that I can be sure that the Souvenir de la Malmaison is getting well sprayed. I have been having a lot of problem with black spot and bloom rot (Looks like botrytis to me) on this rose so I trying this to see how well it works. Basically the week after the Rose Crown, all the blooms on the bush were rotted. I have been using about 6 weeks and I think that the black spot has decrease (though not gone complete). As for the botrytis, I just haven’t had many blooms so I can not tell. The lack of blooms may be because the weather has gotten hot or maybe I need to feed the bush. Oh, by the way, I tried this product on some other bushes and I can say that Knockout and Rosa Mundi do NOT like this stuff. It burned the hell out of the leaves… I thought someone had spilled something on the Knockout.